27-November-2007: "I Need To Travel In One Light Weight Legal Carry On Bag, Pack Two Lights And I Hate Backpacks"
The reader of my blog went on to tell me there is no way to create a kit that will allow them to carry two lights, two stands, other lighting gear, a minimum of two bodies, five lenses, laptop and other related accessories and still meet the British Airport Authority (BAA) size and weight restrictions. In one way the person is right, you cannot pack this in one legal carry on when departing from most of the BAA airports (some airports are more relaxed than others), however you can create a complete kit that will travel in two bags, legal carry on from the vast majority or departure points, and that will protect your lights completely while departing from BAA airports. Aside from flying from BAA airports, some airlines have a single carry-on restriction. This allows for one carry on NOT one carry on and one personal item. Singapore Airlines often enforces this, as does Emirates, obviously any flight departing the UK, and some other Euro and Asian based carriers. My answer to this packing problem is obviously a two bag system. The bodies, batteries and lenses go in the old reliable Domke F-805 while the lights go in my often mentioned, and highly versatile, Pelican 1514 (http://Pelican1514Case.notlong.com). The Domke F-805 looks like a basic laptop bag, it is small, designed long before photogs used laptops daily and will never get a second glance from anyone at the gate causing then to weight it. Should someone ask to weight it, you simply remove your laptop, take out the two bodies, stick a lens on each body, sling them on your shoulders, then weigh it. Why do you do this? No airline counts cameras on your shoulders as carry on or personal items, and the laptop being removed is for the safety and security of your laptop. Personally I have never had anyone give my heavily loaded F-805 second look or challenge me on it being a “personal item,” in any airport or in any country. 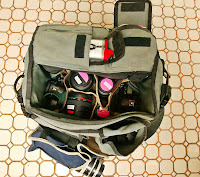 The unassuming profile of the bag is great because when I pull out the Domke F-805 it is often loaded heavily with two or three bodies, 5 to 8 lenses, a flash or two, a laptop (at times two), batteries, chargers, emPower inverters, etc. I have traveled through one of the most difficult airports, London Heathrow (LHR), with this bag loaded to the brim and it has never been pulled aside to be weighed by any airline staff or airport official. One of the beauties of the F-805 is that is looks deceptively small while actually being quite deep and able to haul a lot of gear, including longer lenses like the 400f5.6. For the most part I have moved away from shoulder bags after having had major surgery on my right shoulder in 2002. I now primarily use backpacks, but I still do love the Domke F-805, I miss using my Domke F-2 and my Domke F-802 is my favourite briefcase……………………….but the person who sent me the e-mail that got this entry rolling stated that they hated to use backpacks. For packing lights, I reconfigure my Pelican 1514 to haul my portable lighting kit. I use the Pelican at times when traveling out on Turbo Prop Flights (my home airport, HVN, is only served by 5 flights per day, all 5 are on Dash 8 Turbo Props, http://USDash8.notlong.com) I also pack this way when traveling through the UK. When traveling to or through the UK, I will depart for the UK with both bags, and on my return out of the UK I can safely check my lighting kit with no fear of it being damaged. If you choose your lighting kit wisely, sticking with shoe-mount flash units you can pack an astounding amount of gear in this small little, light weight, legal carry on! Not pictured in the photos below are an iPod, headsets, sleeve of DVDs , APC emPower in-seat power inverter, magazines. I know I should have pulled them out to shoot them, but I shot it late at night, after having put my kids to sleep and I was tired. Not pictured in the photos below, hidden under the foam padding, is a zip-wire cable and three locks, two to lock the case and one to lock the zip-wire and Pelican case to a bench for some security. So for those who don’t want to carry the extremely heavy all-in-one Think Tank Airport Addicted backpack, try out this set up , or your own variation of this set up. 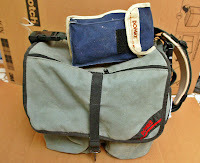 I suggest possibly swapping out of the Domke F-802 for a low profile backpack, such as the the Mountainsmith Parallax (http://ParallaxOverview.notlong.com ) that can hold a lot, but is small and is easily worn by women and people who are not very tall. Below are a few photos of both the Domke F-805 and the Pelican 1514 in the setups I have discussed here. Actually, cameras slung on the shoulder *are* considered as a hand luggage item in the UK. Certainly it has whenever I’ve travelled in the last year or so. Then again, if you have a coat with pockets big enough for cameras, you’re OK. I have flown through LHR and LGW in the last year a few times with a 1D on each shoulder, usually a 16-35f2.8 on one and a 70-200f2.8 on the other, or a 24f1.4 on one and an 85f1.2 on the other. No one ever questioned these two bodies, in addition to my backpack. I walk up, place the back pack down, then drop the two cameras in the bin with my jacket and no one has said a word to me, other than one security agent laughing at the pink tape on my 1Ds. When I know I’ll have more than will fit in my backpack, and I need to carry it, I have worn a photo vest. Yes, I mock tan photo vests most of the time, I own three, two are very worn out, they have their purpose, but generally I do not wear them. Why do I still have them then? Because I can stuff two 1D bodies, four lenses, six batteries, a flash an e-TTL cord and 8 “AA” batteries. If you approach security and take off your loaded vest placing it in the x-ray, it is considered clothing . There are NO restrictions to the weight or general contents of your clothing pockets (well no knives or uranium obviously). Maybe I do it to smoothly, I am not sure, but I have had multiple transits through BAA airports with no problems. Most of my departures are from LHR’s T3 and LGW’s South Terminal. I have also done this through LHR T1 while flying BMI. I am sorry your experience has been different. I will ask around and see what others have experienced, maybe I just get lucky a whole lot. Just a quick aside on the UK airport thing – Ryanair check in at stansted has been a major pain in the rear the last few times I have flown. Insisted on weighing hand luggage and wouldn’t accept a camera as something I could carry outside a bag. Also had problems at Luton airport as well. Flying with a Low Cost Carrier (LCC) can be problematic. Ryanair is one airline I will not fly on, they fly to airports far from actual cities, they weigh everything and pinch you ever way they can. Ryanair even has the seat recline removed, along with the window shade to cut costs. In fact, not to long ago Ryanair custom ordered their 737 aircraft without the “eye brow” windows for the pilots in an effort to save money! Easy Jet can be slightly better and easier for a photog, but still not as easy to deal with as British Airways or BMI (look into BMI Baby). BMI Baby has NO weight restriction for carry on! The limit is that you must be able to lift the bag to the overhead with no assistance. In Europe, other LCC’s I know that can be problematic are FlyBe, Air Berlin, Blue1 and Fly Nordic. In Europe I have heard of photogs successfully getting on the plane with a legal carry on and two bodies out and on their shoulders when flying on Thomas Fly, Aer Lingus (which is not technically an LCC), Fly Globespan, Wizz Air and Condor. The Low Cost Carriers operate in a very different manner than “mainline” airlines. This is not only an issue in Europe, but also in Asia as well. Oddly enough here in The States one of the most relaxes airlines for flying photogs is Southwest Airlines (which Ryan Air built their business model on initially) , Southwest even offers “pre board” to professional photogs who need to stow their gear before the rest of the passengers board. Um, who the hell wants to fly through the UK? And things like this make it no better than it is. I try to avoid any British airport like the plague for this reason and because of the awful design and coffee I usually encounter there. Who wants to fly through the UK ? People who live in the UK and have to deal with BAA and UK airports. I have worked in the UK many times, in fact aside from where I was born, New York City, the place I feel most at home in the world in London. So it is not a matter of traveling through the UK, it is about having to deal with UK airports really. I do know this , many flyers enjoy British Airways, if they want to fly BA they need to connect through a BAA airport. Many flyers enjoy BMI (I am a BMI Gold flyer) and they must connect through BAA airports as well. So to say it is a hole is not really a valid or viable comment when it comes to the nuts and bolts of traveling and doing your job as a photographer no matter where that may be. Oh yea, LHR T3 has a Starbucks that is 24hrs with benches that have no arm rests. On a long layover , or overnight stay, you can get some decent coffee or pastry, then go lay down and take a nap in T2 near the T-Mobile benches. There are walls to lean against, AC power and relatively few overnighters in this area. Even 20 years ago, it was difficult to get a decent cup of coffee anywhere in the UK, but luckily that’s imporved. If you feel the need for a hot beverage on the island, ask for “station tea”. Anonymous, I suppose people with the cojones to put their name to their post might want to fly to or through the UK. If you choose not to go to the UK, everyone’s happy, I suppose. While you mention the UK, just a tip which could be applied for all trips – don’t assume just because you get out on an airline with one set of gear you will get back in with the same set of gear. Flying from the US to Australia on an Australian carrier, carry on weight wasn’t checked, just volume. However coming back into the US from Australia on the return flight, same carrier, they weighed the bags and we were a couple of kilos over. No go. So it goes to show, there’s rules and then there’s who enforces them. In the end we reshuffled things from carry on to checked bags, but doing that in line at the airport counter wasn’t our idea of fun. It is true that there are some “universal” problems with airlines. Some carriers have domestic, or “exdomestic” carry on requirements that are not the “exinternational” return to the US rules (FYI “ex” means departing from, so if your flight is “exJFK” you are departing from JFK). A great example of this is that US Airways and Continental both have carry on size allowances that are approximately two inches larger in length that any other US carrier. Many flyers know this who travel on these airlines. I have seen problems more than once on US Airways returning to the US from London Gatwick, and once on Continental returning from Tokyo Nartia. The passengers pleaded that he bags had been allowed to depart the US and were confused why they could not carry them on returning to the US. The answer is simple the rules of the departing airport apply, not the rules of the airline. So yes, learning to get around the system is good for travel from all points of departure, not just for those departing from the US.